Why do cyclists need sports massage? Cycling is a physically demanding sport which can involve hours in the saddle and short recovery periods followed by further long rides. 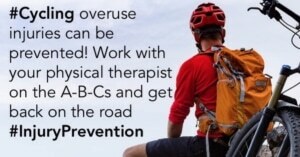 Consequently many cyclists suffer with overuse injuries. This is often exacerbated by poorly fitting equipment. Although cycling is not a high impact sport like running, there are significant demands placed on the body by the aerodynamic riding position. Most professional cyclists employ a Sports Massage Therapist as part of their support team to provide ongoing treatment. Why do cyclists need sports massage? Sports massage is a specific area of massage therapy that has been developed to help improve sports performance. We incorporate remedial techniques into a massage treatment to improve the body’s movement & deal with injuries & postural problems. Sports massage is deep tissue massage which will stimulate the muscular & nervous systems rather than just offering relaxation. We can adapt treatment to enhance pre-event preparation, to offer assistance during an event & to aid recovery post-event. Any sportsperson places stresses on their body by frequent training & competitions. Rest days, stretching, good diet & hydration will help the body recover but sometimes more is needed. Sports massage will aid blood circulation removing waste products from tired muscles & will stretch out muscles that have become tight from repeated use. Many cyclists use regular sports massage to help maintain optimal athletic performance. Sports massage is also an effective way of detecting minor soft tissue problems & dealing with them before a more serious injury occurs. It is an excellent way of relieving tension & tiredness, and of providing relaxation. Pre event massage should be vigorous and warm up the muscles preparing them for action. Specific stretches and other techniques can be used to minimise any ongoing niggles. Post event massage flushes the muscles through and helps disperse waste products stimulating fresh blood flow. It helps to stretch and relax muscle fibres reducing muscle soreness. This means the rider should feel fresher for the next training session. Post event massage should be relatively light as the body has recently undergone significant stress. Maintenance massage further assists post ride recovery. Done regularly it leads to greater flexibility and less injuries, allowing the cyclist to train more frequently. It keeps him tuned up, able to rest more comfortably and ready for the next ride. Most remedial work on injuries and problems is done during maintenance massage. Your lower back is under constant strain by being in a forward flexed position. This can cause injuries to your hip flexors, lower back extensors and the sciatic nerve. Also, the hamstrings never fully lengthen while cycling and this causes them to shorten over time. The hamstrings can then alter the position of your pelvis which can cause lower back problems. Cyclists need sports massage as deep stretching techniques are used to re-lengthen hamstrings, lower back and hip flexor muscles. Loosening these areas along with the chest is very beneficial. Your tight chest will impair your ability to take full breaths reducing oxygen intake and therefore performance. Your neck is affected by having to hold the head up and look forward, and also by the extra weight of your helmet. A stiff neck can soon become painful if not dealt with and cause headaches. Cycling is extremely repetitive. You constantly push through hard miles for hours while your hands grip the handlebars. This can cause stresses on your wrists, shoulders, hips and knees. Your powerful quadriceps and calf muscles are particularly susceptible to muscle strains. If you should suffer a strain (pulled muscle), you need sports massage to treat scar tissue. If left behind, this can give rise to a re-occurring injury. Get properly fitted for your bike. Visit a reputable bike shop and have them check your measurements and adjust your bike accordingly. Seek expert advice when purchasing a bike so they sell you the correct frame size. If you are new to cycling or have just come back from injury increase training gradually. Build up your base riding on the flat before tackling long hilly rides. Strengthen your core! Training tends to be riding only which is great for legs and buttocks but does little to strengthen core muscles. Pilates is an excellent way of building core strength. Strong legs and arms that are supported by a weak back and soft abdomen are a recipe for disaster. Stretch properly and frequently, particularly after a hard ride. Pay attention to good nutrition and hydration. Visit a good Sports Massage Therapist for regular maintenance. Most running injuries are curable by simple techniques. Injury breakdown point ……. the curse of the runner! Every running injury passes through four grades of severity. Running injuries are not an act of God! 8 most common cycling injuries and how to avoid them!